Valentine’s Day is this week and it’s the perfect time to show your team members a little love. After all, your employees are the heart of your business.Finding the right Valentine’s Day gift is a common dilemma. Coming up with gift ideas appropriate for employees is almost impossible. But fortunately, we have the best solution – Chamber Cash!Chamber Cash allows your employees to choose their own gift from OUR local merchants, retailers, restaurants, candy stores and more! And you can send a gift to everyone in your organization with just a few clicks of the mouse – a time-saver for you.Demonstrate how much you appreciate all the hard work your employees put in for the business throughout the year with the best gift of all, the gift of choice. Research shows that employees who feel appreciated by their boss work harder and are happier in the workplace! And who doesn’t love that? 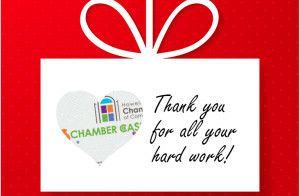 Chamber Cash is a great gift for everyone on your Valentine’s list – spouse, parents, kids, teachers, etc. Impress without the stress! Buy ChamberCash by clicking here.